Use TouchID sensor as home button. "Give you home button a break." Virtual Home also comes with a feature called "QuickUnlock". 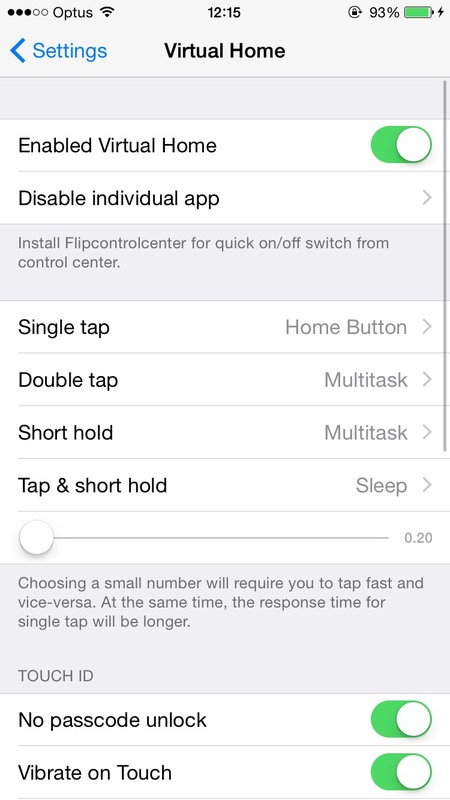 "QuickUnlock" allows you to unlock or wake up device by touching the TouchID when the phone is in standby mode. It will consume more battery but Virtual Home comes with options to turn it off automatically after a period of inactivity. Virtual Home will also unlock your device even if your device is not passcode locked - you can unlock your device by holding the TouchID instead of sliding to unlock. You can also disable Virtual Home inside any particular app. It has been tested to work with BioLockdown, iTouchSecure and other TouchID related tweaks. - Device vibrates after unlock with Biolockdown installed fixed. Long and overdue update is out! Sorry for the delay.